(CNN) - Several close friends and supporters of Hillary Clinton tell CNN they are pushing for a "graceful exit strategy" that would allow the Clinton and Obama camps to come together, and for the New York senator to save face should she fail to become the Democratic nominee for president. The discussions are not taking place between the campaigns, but rather among informal campaign advisers on both sides who are trying to actively influence and shape the debate as the competition nears a close June 3. Bill Burton, national spokesman for front-runner Barack Obama's campaign, said "there are no talks underway between the campaigns," and that any suggestion from Clinton insiders is "unequivocally untrue." "We are two campaigns, in real competition, not having any such talks about exit strategies," Burton said. Obama campaign chief strategist David Axelrod said "there have been zero discussions, back channel or otherwise between the campaigns." Clinton campaign aides also deny that any talks are taking place between the campaigns, emphasizing that the contest is not yet over. Clinton herself said the report was "flatly untrue" during a meeting with the editorial board of a South Dakota paper Friday. But some Clinton camp insiders and close friends are actively floating three scenarios which they believe will influence whether or how the two teams merge. Yes it would be a big mistake making her "VP" because this means BHO would be the "P". She has the popular vote and will open up a wider margin after all the contests are over! Hillary is and always has been the strongest candidate and may she go all the way to the convention to prove it! Go Hillary and Go Democrats! Alex, she had the opportunity for a graceful exit in both Kentucky and W. Virginia. Sen. Obama didn't campaign didn't campaign to any real degree in those areas, he just allowed himself to be beat-down. Don't you think if he had really campaigned there he would have. He gave her every opportunity to exit gracefully. But her ego??? Well, you know the rest. So here's the final act of Clinton entitlement. You lost. You lost. Fair and square. Obama BEAT you. I know that's unfathomable in your mind, but it's the truth. He's the better candidate and HE BEAT YOU. You can whine and complain and try to change the rules and blackmail with your supporters but in the end, you need to accept that you've been beaten. You are not entitled to anything because you're a Clinton or because you're a woman. Enough. I have a great "exit strategy" for her. When the last primary is over and all the votes are counted – just go away. This would be one black spot on Barack's standing if he takes her as his VP. Defeats the purpose – change? Not if she is on the ballot. I wish Edwards agreed to be his VP. I sincerely doubt there would be this type of discussion of graceful exit strategies if the shoe was on the other foot and Hillary was the front runner. Let's remember Hillary was very emphatic about her thoughts on Obama being a capable VP. Why hire a VP who doubts your own ability to lead? Obama offering Hillary the VP slot would demonstrate the same "lack of judgement" stamp critics keep waging against him. I don't see why the Obama campaign needs to do anything in regards to helping her save face or help her foot the bill for a losing campaign. She didn't run the expenditure of campaign funds (an extra $6 million of her own) by Obama, so I'm unclear as to why anyone else should foot the bill. That would be relatively ironic in a 2008 "chivalry ain't dead...I'll pay the bill, baby" sort of way. It was a well fought race, she did the best she could, and the best man is winning. No pun intended. Here is the fact, with or without Clinton as the VP, Obama is destined to lose to McCain. I can't wait to see him lose and just disappear for good just as Dukakis and Kerry did. He is going to be another loser. You got to be the worst to lose to McCain after two wonderful Bush terms. Stop the nonsense! Hillary is the better candidate all the way!! I don't want her to be VP! I want her as MADAM PRESIDENT! I hate to admit it but I won't be voting this year for the first time since I was 18. It's time that this country was run by a strong woman and not another Male! I don't care if it is Obama or MCCain. Get back woman, you're not good enough to hold the number one spot. Remember, we have already had a woman VP! Get back Girl! America isn't ready for a woman president! That's the real issue!!! How about a cabinet post? Those have an even higher proportion of executive character over, say, legislative character. But which one would her experience best serve her? I wouldn't know. Secretary of State? 5 Superdelegates for Obama today! 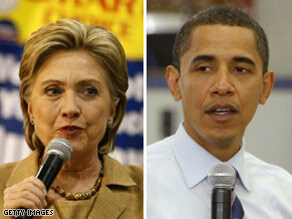 Why exactly is there a need for a Clinton "save face" strategy involving the Obama contingent??? She is losing. She needs to lose gracefully and swallow her narcissistic pride (if that is possible for her) and get on with supporting Obama. Let's hope Obama is smart enough to choose another VP and leave her ALONE. divisive, how can obama put her on the ticket. "graceful exit stragedy"
and "save face" arent on this womans list of destruction. If the two of them can't find a way to put aside their differences then the Democratic nominee is doomed to fail in the general election. Obama could not change the poverty and crime hotbed of his south Chicago district, what can you expect he can change and improve on the nation's economy and security? She should have considered saving face & a graceful exit 10 million dollars ago. Wasn't her supporters just this week sreaming about her sexist treatment. Now she want to be all "girl" about her exit, Man up Fighter. How about scenario #4 : IGNORE HER, no VP offer fake or not, let her pay off her own debts, Bill made 51 million giving speechs you can do the same with all your free time. Finally don't let the door hit you on the way out.